On March 20 2018, Amazon became the second most valuable company in the world, with a market capitalisation exceeding $768 billion. The US retailing giant made key investments in 2017, including an offer to buy the Whole Foods Market organic grocery chain at $42 per share, or a total of $13.7bn. Amazon has gained almost $19 bn in market capitalisation shortly after the announcement, and the acquisition was finalised in August 2017. So what are the motivations behind this acquisition? Who will be the winners and losers? The second “A” in the acronym of US web giants, GAFAM (Google, Apple, Facebook, Amazon, Microsoft), Amazon realised $178bn in sales at the end of 2017 versus $136bn at the end of December 2016. The company employs 341,400 people and has built its reputation on the distribution of music, books and cultural content. The online retailer makes every effort to optimise its selection of items, their prices and the speed of delivery, including its well-known “Prime” service, and is exploring the possibility of delivery by drone. The company made his first steps into the food industry in 2008 with the launch of AmazonFresh in the United States. For a monthly fee, customers can order fruit or vegetables online for home delivery. The service was subsequently expanded to London and Boston in 2016, and Tokyo, Berlin, Potsdam and Denver in 2017. Amazon clearly wants to expand its presence in food distribution, a market valued at $800bn according to Fortune. As the online demand for food has yet to be a big success, Amazon has turned toward a multi-channel offering, expanding from e-commerce to investing in bricks-and-mortar stores. A particularly innovative example is AmazonGo. Using artificial intelligence and RFID – what Amazon has dubbed the “just walk out technology” – customers with the AmazonGo application simply enter one of the stores and select the items they wish to buy. Every time a product is taken, it’s automatically added to the customer’s personal Amazon account – no more need to wait in line or go through a physical checkout. The first AmazonGo store opened in Seattle in January 2018, and if the initiative proves successful, Amazon plans to open 2,000 in the United States and then Australia. A revolutionary new way of shopping? Certainly, but it also raises questions. What would happen to cashiers’ jobs were this system widespread? Technical snags have also slowed Amazon down, as revealed in a Fortune article, “Amazon’s Cashier-Free Store Might Be Easy to Break” – the technology is not currently sophisticated enough to manage more than 20 customers at a time. So this may be one of the reasons why Amazon is stepping up its multichannel offering by turning to Whole Foods. What is Whole Foods Market? A leader in the distribution of natural and organic food products in the United States, Whole Foods Market is the first US-certified organic distributor. The group generated revenues of $15.7bn at the end of September 2016, $1bn in operating cash and had a return on invested capital of 12.7 per cent. 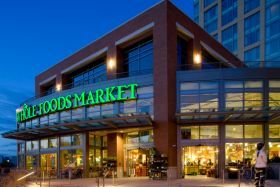 Founded in 1978, the first Whole Foods Market store opened in 1980 in Austin, Texas. At the end of September 2016 the chain had 456 stores – 436 in the United States, 11 in Canada and 9 in the United Kingdom – and employs 87,000 people. Whole Foods pays particular attention to the source and quality of its products (natural and organic), its staff and is involved in the local community. In fiscal year 2016, Whole Foods Market launched a store format called 365. With the goal of offering the best value for money through carefully selected products, the 365 stores have a simplified operational model, with central purchases and automatic inventory replenishments. Why did Amazon buy Whole Foods Market? The acquisition of Whole Foods by Amazon makes it possible to combine two leading brands, both focused on a customer-centred approach. Partnering with Whole Foods will allow Amazon to expand its multichannel offering and further enhance the customer experience. The potential for development is enormous because Whole Foods Market is mainly present in the United States today, but the concept could be extended to other countries. Lastly, Amazon is now confronted with the challenge of seasonality: 33 per cent of annual sales are made in the fourth quarter of the calendar year. Diversification into food would help to smooth out its cash flows. Nonetheless, the acquisition raises some important questions. The first is employment, because Whole Foods places considerable importance on its employees. It has been considered one of the top 100 US companies to work for 20 years, according to Fortune magazine. As at September 25 2016, Whole Foods Market has approximately $3.5bn in fixed assets (stores, leasehold improvements, etc.) on the balance sheet and $1bn in long-term leases for some other stores. In the foreseeable future, will Amazon keep all the Whole Foods bricks-and-mortar stores, and all the employees who work there? The second question concerns the pricing policy and the possible divergences between Amazon and Whole Foods. The organic chain adopts rather high prices – generally 10 to 30 per cent more than its direct competitors – and has sometimes been criticised on this aspect. It is one of the reasons why the group has launched the 365 stores. Amazon, on the other hand, is anxious to offer competitive prices. Will Amazon offer products with higher prices or will Whole Foods reduce its prices? The third question concerns the digital investments Whole Foods Market has already made and is continuing, for example, with the introduction of EMV (Europay, MasterCard and Visa) technology at the point of sale and the distribution of digital discount coupons. Finally, what will happen to the partnership that Whole Foods Market has formed with Instacart, the start-up created in 2012 (by a former employee of Amazon), which manages the deliveries of Whole Foods Market and in which Whole Foods has also taken a financial stake? The big winner is of course Amazon. The Seattle group should not have difficulty absorbing Whole Foods, whose purchase price seems fairly reasonable in terms of its turnover: almost $16bn at the end of September 2016. The group expects its sales to grow by 2.5 per cent to 4.5 per cent in 2017, with operating profit representing eight per cent of sales while maintaining a return on investment target of at least 11 per cent. Conversely, the main players in distribution seem less solid. Even Walmart, the world’s largest distributor with nearly $486bn in sales, saw its market capitalisation fall by $12.8bn, a 5.4 per cent drop, between June 15 2017 ($237.8bn) and June 23 2017 ($225bn). In any case, this reinforcement of Amazon in food will only accentuate trends already noticed at the level of consumers who leave the hypermarkets for local businesses and increase their online purchases. In the United Kingdom, Tesco, the UK’s largest distributor and private employer, is still struggling to regain its customers. The latter now focus on convenience stores with smaller daily baskets and supplement them with online purchases. This trend is not new, as at the end of February 2015, combined with a hard-fought price struggle by the “hard discounters” Aldi and Lidl, Tesco had published a historic loss of £5.7bn. Sainsbury's and Marks & Spencer also suffer from the same pressures and their financial results have been disappointing. Tesco posted a loss of £40 million at the end of February 2017, but its turnover has fallen by 9.75 per cent since February 2015. In France, customers are also abandoning “hypermarkets”. French retailers like Auchan, Leclerc, Carrefour and Monoprix are adapting their product offerings and changing the formats of their stores to deal with profound changes in consumption patterns. Beyond the efforts already made by these French retailers, they will have to further strengthen their online presence and invest heavily in high-performance information systems and data analytics. A trend probably anticipated by Carrefour with the appointment of Alexandre Bompard, who had successfully led the digital shift of Fnac.com to become the third largest French e-commerce retailer behind Amazon and Cdiscount. On January 23 2018 Carrefour unveiled its transformation plan for 2022. In addition to a voluntary departure plan of 2,400 people for France, it announced massive investments in digital of €2.8bn by 2022, a target of €5bn in sales in food e-commerce by 2022 as well as a target of €5bn in organic sales in 2022 (from €1.3bn currently). Amazon has already revolutionised the distribution of music and books – will it also revolutionise food distribution? The group has efficient logistics platforms and has invested heavily in its information systems and merchant sites since 2012. It is also continuing the development of the “just walk out technology” of AmazonGo stores. The acquisition of Whole Foods is thus not good news for large distributors. The US giants have all seen their market capitalisation falling in recent days. European distributors are also concerned by these new modes of online consumption and the need for a multi-channel offering. In France, major distributors are lagging behind in e-commerce and the arrival of Amazon as a new competitor as well as that of Costco on the French market since June 22 2017 only make the challenges even more important. The food distribution industry is a low-margin industry and therefore the search for efficiency and economies of scale are key elements. Even though today many consumers are still in the store to choose their fruits and vegetables (and especially in France), these habits may well change in the next 25 years. Amazon, which has often been a trendsetter, will only facilitate the use of e-commerce and may well have a significant impact on food distribution if it does not change. Amazon is becoming so big and financially powerful that it can afford price cuts, a model that may not be sustainable for other food retailers. After including Whole Foods Market aggregate net sales of $5.8 bn since the acquisition in August 2017, Amazon reported record results for 2017 with net sales amounting to $177.9 bn (up 30.8 per cent) and a net profit reaching $3bn. The American giant is even targeting the French market. Reuters announced on February 28 that French retailer Systeme U is discussing a possible grocery-supply deal with Amazon. With almost $31bn in cash and cash equivalents and marketable securities, Amazon has the ability to perform more acquisitions in the future and benefits from a strong bargaining power. It seems that Amazon is indeed aiming at becoming a key player in the food distribution at a worldwide level.